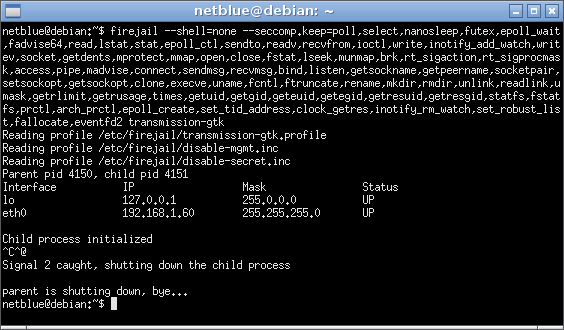 Firejail is a generic Linux namespaces security sandbox, capable of running graphic interface programs as well as server programs. The sandbox is lightweight, the overhead is low. There are no socket connections open, no daemons running in the background. All security features are implemented directly in Linux kernel and available on any Linux computer. Seccomp-bpf stands for secure computing mode. It’s a simple, yet effective sandboxing tool introduced in Linux kernel 3.5. It allows the user to attach a system call filter to a process and all its descendants, thus reducing the attack surface of the kernel. Seccomp filters are expressed in Berkeley Packet Filter (BPF) format. In this article I’ll show you how to build a whitelist seccomp-bpf filter and how to attach the filter to a user program using Firejail sandbox. Throughout the article I will use Transmission BitTorrent client as an example. Linux has several tools for listing syscalls. I guess the easiest one to use is strace (apt-get install strace, yum install strace). I start transmission-gtk in strace using -qcf options (quiet, count, follow). I play for about 5 minutes with the program, go through some menus, start and stop a download etc. It looks ugly in this moment, a kilometer-long command line that doesn’t even work. For some reasons strace missed some syscalls. Time to bring in the system logger. Looks like I need to add time syscall to the list. I keep on adding syscalls to the list as they are reported and try again. To get Transmission working I ended up adding pwrite64,time,exit,exit_group on top of what strace reported – not too bad! Firejail installs in /etc/firejail directory security profiles for several popular programs. The profiles define a manicured filesystem with most directories mounted read-only, and several files and directories blanked in $HOME, mainly files holding passwords and encryption keys. The command “caps.drop all” in the security profile above disables all capabilities. Linux capabilities feature of Linux kernel is similar to seccomp, but works deep inside the kernel. Between seccomp and capabilities more than half the kernel code is disabled. Whitelist seccomp filters are easy to build, yet they need lots of testing. The filters are not portable. For example this filter build on Debian Wheezy will not work on Ubuntu 14.04. The exact list of syscalls depends on the kernel running the system, the version of the program and all the libraries the program is linking in. For more information about Firejail, visit the project page. This entry was posted in Projects and tagged Firejail on April 13, 2015 by netblue30. Do you recommend building a whitelist for your favorite browser? Thanks! The filter could break next time your distro installs an update for firefox, or an update for flash player or any other plugin/extension you have installed. I use firefox with the default seccomp blacklist filter, never tried it with a whitelist filter. Could you consider having an option (maybe –seccomp-explicit) which *only* blacklists the syscalls specified? That would be very useful in the case of firefox, where the Hangouts plugin requires ptrace. seccomp.keep does not accomplish this, and nothing else allows me to whitelist a previously blacklisted syscall. Use “–seccomp.drop=syscall,syscall,syscall…” instead of –seccomp.keep or –seccomp. It blacklists only the calls you specify. You will also need to allow capabilities, so remove “caps.drop all” line from /etc/firejail/firefox.profile. Thanks! Although I’m curious…why would I need to remove caps.drop all? I tried just adding seccomp.drop and it seems to work fine, blacklisting all the syscalls I specified. There seem to be a sys_ptrace capability. 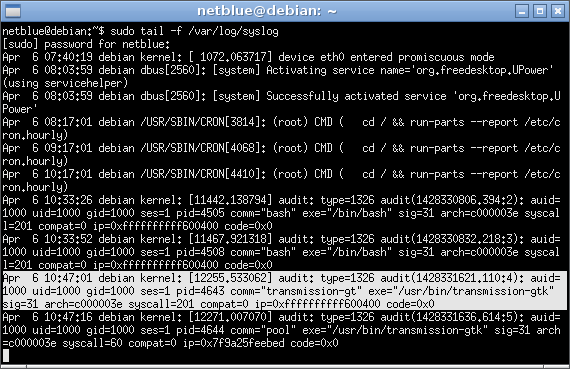 Both seem to work just fine – that is, all capabilities are dropped and the relevant syscalls are blacklisted. Um, you should know that ptrace completely defeats the purpose of seccomp. It’s even displayed in the manpage. Basically, the SETREGS ptrace flag can be used to break out of a seccomp sandbox by messing with registers holding the syscall number and arguments right before it’s called (seccomp filters are checked for permission before ptrace is allowed to mess with things… or in other words, ptrace is allowed to mess with registers right before entering kernelmode, even after a process has been given “permission” by seccomp). Seccomp is not typically meant for the end-user. It requires you actually know what you’re doing and what the effects on the program will be. It’s not just a “whitelist all syscalls the program needs and you are automatically secure”.